Quinta da Matina is a beautiful renovated farmhouse set in mature sub tropical garden on the edge of the village of Portelas, having views of Funchal ridge to the south and Monchique mountains to the north east. It is ideal for people looking for a tranquil location yet being very near the beaches and the historic town of Lagos with its many restaurants, beach bars, the marina, interesting shops and discos. Bathroom 1 - with bath, shower over, bidet, toilet and basin. Bathroom 2 - en-suite to bedroom 2 - Shower, toilet and basin. Bathroom 3 - en-suite to bedroom 3 - Shower, toilet and basin. Cloakroom - with toilet and basin. Large comfortable lounge with wood burner, IPTV, DVD player, radio CD player, stocked with books and games, patio doors lead onto covered terrace for alfresco eating overlooking the pool. The dining room is spacious and has table seating for 8 people. Large fully equipped, cooker, hob, fridge, dishwasher, microwave, juicer, blender, toaster, kettle, all crockery, glassware and utensils. Palmares (which has spectacular views over the Bay of Lagos)and the new Boa Vista 18 hole Golf courses are 10 minutes away. Penina Golf course has choice of two 18 hole and a 9 hole courses and are 20 minutes away. Parque da Floresta has a challenging 18 hole course and is 25 minutes. We have stayed at many holiday rentals over the years and can honestly say that this is the best. Spacious, cool, comfortable with a lovely interior and spacious exterior with a large pool. Even on the hottest days the interior remains deliciously cool. The bedrooms are comfortable and elegant and the kitchen and living rooms are extremely generous and well kitted-out. The owners live next door but you'd never know it as the house feels secluded and private. When we had a very minor problem with the water the owners fixed it almost before we'd noticed. All in all, my whole family loved just hanging out indoors or around the pool and we sincerely hope to return in the near future. We also had many happy excursions to Lagos and beyond. A gem of a house with a lovely atmosphere. The house is an "L" shape around a lovely pool where there is plenty of shade from the midday sun. It is well furnished and comfortable. We stayed with our children (aged 18 and 20) and their friends who, because of the close proximity of Lagos itself, where able to go into town in the evening with only a short (and cheap) taxi ride home. The owners live next door. They keep themselves to themselves but are on hand if you need anything. We have been renting villas around Lagos every summer since 15 years now and this one has by far beaten our quality/price expectations. 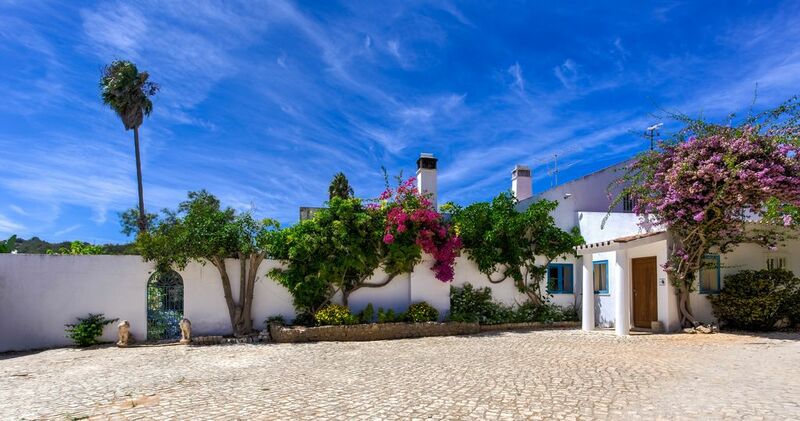 It's actually a renovated Portuguese farm but although big, it has loads of charm. It's very calm and peaceful, if you hate having other villas overlooking your pool and terrace then this is the place for you. Basically a small paradise. The pool is simply huge and the terrace and gardens well kept and beautiful. The house was impeccably clean and was well equipped with everything you need and very comfortable beds. Our only complaint is that there were no beach towels! Good wifi connection, so the kids were happy. We will definitely be renting this villa again next year! Thank you for taking the time to write a such a nice review and thank you for taking the villa and leaving it clean and tidy, your comments regarding your beach towels are noted and we will supply them next year when we look forward to your return. Beaches in Lagos are about 2.5 kms, 5 minutes in the car. There are many other beaches further along the south coast worth exploring within twenty minutes drive. The west coast is about 25 minutes and popular with surfers and is always quieter even in high season. Faro airport is 78 kms and under one hour drive on the new motorway to Lagos. Car hire is strongly recommended . We can let you have Car hire details and rates of a very competitive local company whom we have dealt with for many years. Portelas village centre is 500 m.
Pria da Luz 12 klms. Portimao/Pria da Rocha 25 klms. For basics there is a mini market in the village an two resturant bars. In Lagos there are supermarkets, fish and vegetable markets, banks, Museum, interesting churches a marina, water sports centre,boat and dolphin viewing trips, tennis, golf, micro lighting centre, there are very many restaurants both for indoor or pavement dining for all tastes and pockets, bars, discos, street entertainers. There is mountain bike riding. Serious Go karting at the race track. Bookings are only possible from Saturday to Saturday at peak times but we can be more flexible outside these times depending on other bookings B ooking Notes: When booking please give name, address, telephone number and other contact numbers, number in party and dates required. A non returnable deposit of 25% is payable with booking, with the balance payable no later than 60 days prior to arrival. A security deposit of £250 is required against damage, broken or missing items but this is returned within 15 working days of you leaving less the cost of any damage, broken or missing items. Changeover Day: Change over day is flexible, arrival time 15.00hrs vacating time 11.00 hrs. Luggage can be left before or after these times by arrangement. Notes on prices: Prices are for the property per week in UK Pounds. Additional number of people over 8 can be accommodated on folding beds at a cost of 50% of the pro rata rate. Cot hire with high chair rental is £50 per week.